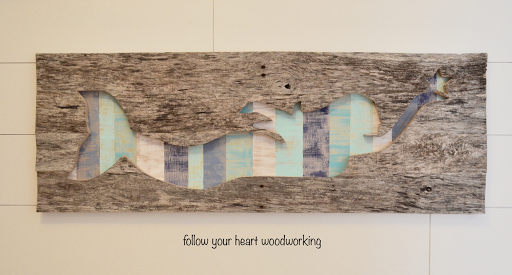 Hers’s another whale I made, it is the same shape as the whale I shared the other day HERE . This time I used a very old piece of wood 36″ long by a full 11 1/2″ wide. I call this a reverse cut out since I use the outside or background of the shape. I don’t know if that is the technical term for it, maybe I just made that up? On the back are separate strips of thin plywood painted in different beachy colours. The mermaid is SOLD but the whale is in my shop along with other designs. That is so cool! I love how it turned out!